How much does it cost to replace main breaker load center? Electric panel replacement cost vary from $750 for 100 Amp with 14 - 18 circuit breakers load center and simple work to $1,650 or even more for 200 Amp with up to 42-circuit breakers indoor main load center and complex work including labor cost and materials expenses. 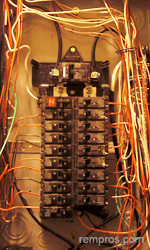 Electrician will estimate total cost of electric panel replacement after in-home inspection and analyzing all details. Possible additional charges and fees besides standard load center replacement will be summarized in itemized estimate. 1 Total cost estimated as an average fee for basic electric panel replacement including labor expenses and cost of materials purchased and supplied by an electrician at his own discretion. 2 Number of man-hours calculated as an average time necessary to complete basic panel replacement by experienced electrician. Actual time might vary and primary determined by difficulty of work. Fees in the chart do not include any additional fees for an extra work besides removal existing and installation new indoor main breaker load center. Electrical contractor will quote main breaker load center replacement or upgrading electric service including cost of labor and all necessary materials which have to be purchased to complete the project successfully. At local retailer all supplies including 200-Amp panel and 25 – 30 circuit breakers can be bought for $360 - $470, but it is uncommon that an electrician will price man-power expenses separately. Many contractors have standard rates for replacing existing load centers depending on maximum amperage. Typically basic work includes disconnecting the box from outdoor power supply line, removal existing panel with all breakers and installation new equipment according to local codes. Partial rewiring or fixing other electrical problems in the house might lead to extra charges and each task will be quoted individually. Bigger houses might have to be upgraded to 400 Amp electric services resulting in higher electric panel replacement cost. How long the house will be without electricity? Typically indoor breaker load center replacement is a few hours project and depending on difficulty of work power will be disconnected for 3 – 5 hours. Very simple work can be completed in couple hours, but complex upgrade can take up to 8 hours during which homeowners won’t be able to use any electrical fixtures. Is it hard to replace electric pane by self? If you are able to manage replacement of main breaker load center safely and according to local codes, you are probably an electrician. But if you have very little knowledge and no skills it is better not experiment or try to learn basics by starting with electric panel replacement. Lack of skills might lead to a huge mistake which might result not only in damaging the property, but cost you your life. For that reason it is always better to hire an experienced electrician for performing any work which goes beyond your knowledge and skills. How much did you pay for electric service upgrade?